The Ortlip Family spans four generations of professional artists. William H. Ortlip was a commercial artist and sign painter by trade during the latter portion of the nineteenth century. Friend of the great American painter Thomas Eakins, he also specialized in still life and landscape paintings in oil, displaying a preference for vibrant depictions of fresh fruit. Henry McCarter, William's brother-in-law, was a prominent and successful artist who became the first instructor of illustration at the Pennsylvania Academy of Fine Arts in 1900. His dominant presence at the Academy influenced many artists. During two trips to Europe during the late 1880's, McCarter met many of the era's celebrated artists, such as Puvis de Chavannes, with whom he studied, and Van Gogh, Pissarro, Degas, and Toulouse-Lautrec, among others. Although McCarter's teaching was considered progressive, he placed primary emphasis upon draftsmanship: "All my students are first as ever academic - I require that. Then we open the window and get it all off our chests and cut corners after the best new learning in art." H. Willard Ortlip, the son of William H. Ortlip, was a gifted and motivated artist. He attended the Pennsylvania Academy of Fine Arts, where he met his future wife, Aimèe Eschner. They both spent time as students of world renowned artist William Merritt Chase. They continued expansive careers as painters and illustrators while raising a family that included seven children, eventually relocating to a large rambling home on the Palisades in Fort Lee, New Jersey, which overlooked New York City. Their original work graced the covers of numerous national magazines and periodicals, including Literary Digest, Collier’s, the Christian Herald, Successful Farming, Modern Priscilla, and many, many others. Of the seven siblings, three became professional artists in their own right. 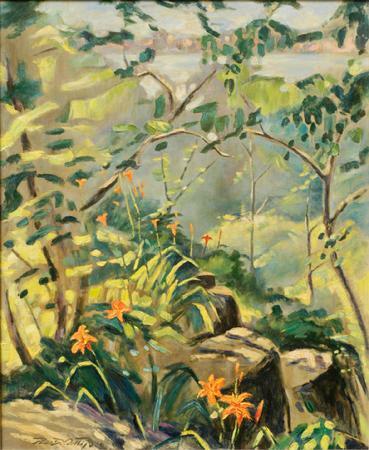 Aileen Ortlip Shea, recipient of a traveling Pulitzer art scholarship in 1935, and Marjorie Ortlip Stockin, among their many accomplishments and awards, founded and taught in the art department at Houghton College in western New York state. Prolific painters, they both have produced beautiful and significant bodies of work. Paul D. Ortlip, the youngest of the seven offspring of Willard and Aimee, found art to be his life’s calling. After serving in the U.S. Army during WWII, Paul trained in New York at the Art Students League and in Paris at the Academie de la Grande Chaumiere. He spent time as a NACAL artist, recording his experiences on-site in Vietnam, and as a participating artist for NASA on the recovery ships for Gemini 5 and the Apollo 12 and Apollo 17 lunar missions. As a portrait artist, he painted dozens of elected officials throughout northern New Jersey and beyond. His work hangs in a vast number of private collections, as well as the United States Naval Historical Center, the Montclair Art Museum, and the Smithsonian Institution's National Air and Space Museum in Washington, D.C. He has been included in too many Who's Who in America and American Art editions to be counted. A volume of his life and work, Paul Ortlip: His Heritage and his Art, by M. Stephen Doherty, editor of American Artist magazine, was published in 1982. Steeped in such a rich heritage, the family includes third-generation painter Janet Van der Eb, fourth-generation artists Robin Eschner, Michele Ortlip, Eila Shea and Priscilla Ortlip, as well as many other talented artists, writers and musicians. Drawing from the vast array of original work from members of the Ortlip family, along with special invited guest artists, Four Generations Art continues this tradition, presenting extraordinary original artwork, along with select reproductions utilizing the highest quality materials available.